When striving to adopt healthy changes in your diet and lifestyle, you can start off by substituting ingredients like butter, oil, cream, eggs, and so on in recipes for baking goods with healthy alternatives. In addition, you can look for better alternatives for general cooking and dessert rrecipes to cut down on calories without compromising on the taste. So, here are some smart and effective substitutions for fat-free cooking. To begin with, you can substitute half or three-quarters of oil or butter called for in recipes for cakes, brownies, muffins, or other sweet and soft baking goods with unsweetened applesauce (preferably homemade). For measuring the amount of applesauce you need, use a liquid measuring cup. Besides, you may consider using prune puree, too. Furthermore, when preparing fudge brownies, you can replace a cup of butter with an equal amount of avocado puree because it has a creamy texture and a subtle flavor. If you are looking for a healthy ingredient to substitute calorie-dense and fat-laden mayonnaise, sour cream, and cream cheese, then you may switch to low fat Greek yogurt. You can use this versatile food to make veggie dips or use it as a marinade. Plus, you can blend Greek yogurt with a little cilantro and put it on your tacos! In case you are looking for a vegan alternative for mayonnaise, you can go for Nayonaise. It is made from soy and contains about half the calories and fats present in mayonnaise. Replace the cream required in a recipe with fat-free evaporated milk. To replace whipped cream, you can whip evaporated milk, frozen partially for a while. If you need heavy cream, though, you may use evaporated whole milk. If you are confused about the difference between evaporated milk and sweetened condensed milk, watch the following video. It also gives information on recpes can make include evaporated milk and condensed milk. 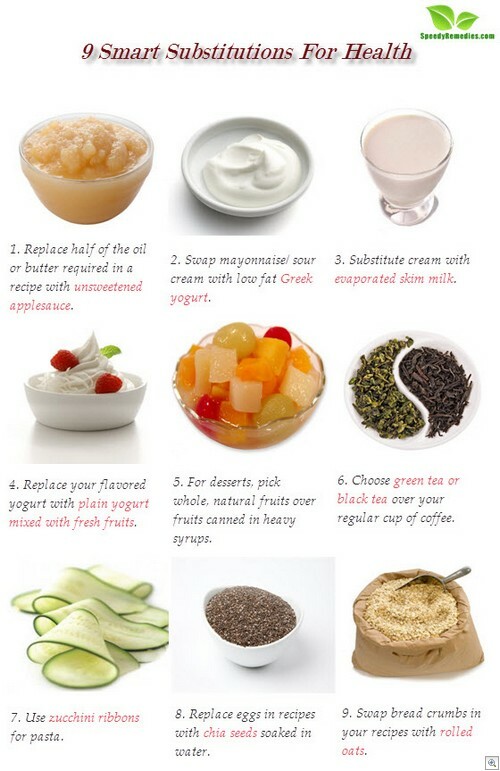 People usually opt for flavored yogurt as a dessert, thinking that it is healthy. However, the fact that it contains extra sugar and calories does not really make it an excellent choice. Thus, instead of flavored yogurt, it is better to go for plain yogurt and add wide variety of delicious fresh fruits in it. Canned fruits, though convenient to use, are packed in heavy syrup. Thus, they have additional sugar and have more calories as compared to fresh fruits. So, it is suggested to consume whole, natural fruits or at least, switch to fruits canned in their natural juices. Prefer to have green tea or black tea rather than coffee as the latter has a higher amount of caffeine. Furthermore, both green and black tea can assist in your weight loss program. When preparing any of these healthy teas, though, prefer using loose green or black tea instead of teabags to make your tea more enjoyable. Cut down the carbohydrates in your pasta meals by switching to zucchini ribbons. You can simply bake or saute thin strips of zucchini for a few minutes and swap your pasta with this healthier alternative especially, if you are supposed to stay away from gluten. You can use spaghetti squash, too. When looking for substitutes for eggs in baking recipes, consider using chia seeds soaked in water. To substitute one egg, you need to soak a tablespoon of chia seeds in a quarter cup of water for about 15 minutes. It forms a sort of gel, gelatin-like mixture that can be used for egg-free baking. You can also add chia seeds in soups, stews, marinades, etc. instead of corn starch. Consider replacing salt-laden breadcrumbs with rolled oats or crushed bran cereal. To improve the taste, you may use rolled oats seasoned with herbs. In case you have other creative substitutions, feel free to share them with us!